Celebrated as the author of five acclaimed historical fantasy novels in the Glamourist series, Mary Robinette Kowal is also well known as an award-winning author of short science fiction and fantasy. Her stories encompass a wide range of themes, a covey of indelible characters, and settings that span from Earth's past to its near and far futures as well as even farther futures beyond. Alternative history, fairy tales, adventure, fables, science fiction (both hard and soft), fantasy (both epic and cozy)-nothing is beyond the reach of her unique talent. 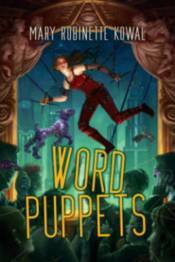 Word Puppets-the first comprehensive collection of Kowal's extraordinary fiction-includes her two Hugo-winning stories, a Hugo nominee, an original story set in the world of "The Lady Astronaut of Mars," and fourteen other show-stopping tales.